We are all about saving you time and thinking outside the box and since Game Day is almost upon us, and we thought we’d share a fun, quick treat to suit both players attending your Super Bowl Party. If you’re attending a party this will trump any dip, any day. Start with approximately 10 cups of popcorn. Once you have the popcorn made, salt it liberally. It is so nice to taste the salty with the sweet marshmallow coating. Not quite like Kettle Corn but close. To make the Marshmallow Mixture melt 3 tablespoons of butter in a medium saucepan. Once the butter is melted, add 3 cups of mini marshmallows. Stir until the marshmallows are melted. Turn off the heat as soon as the last marshmallow has melted. If you like you can add 1 tsp. of vanilla to the melted marshmallow mixture at this point. Slowly pour the marshmallow mixture over the salted popcorn. Gently fold the marshmallow mixture in with the popcorn until the popcorn is mostly covered. The amount of marshmallow mixture you want to add is really up to your own taste. The more you add, the stickier the popcorn will be so we suggest that you add it a bit at a time, stir the popcorn and give it a taste before you add more. Leave a little bit of the marshmallow mixture for the next step. Now pour the popcorn onto a cookie sheet covered with foil or a Silpat liner. Drizzle a little bit of the remaining marshmallow mixture over the popcorn but do not mix it up. You will need the mixture at the top so the candy will have something to stick to. 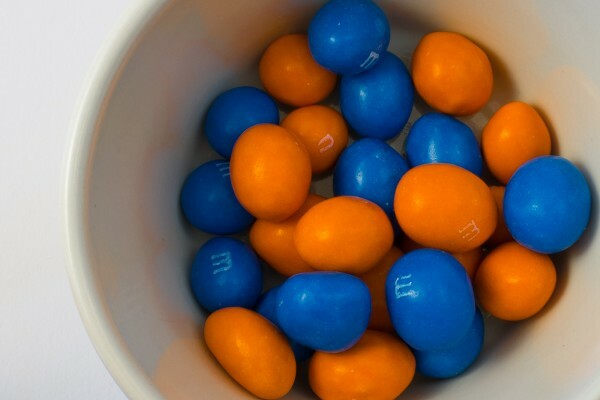 Use a handful of orange and blue M&M Minis, a handful of orange and blue Pretzel M&M’s and a handful of Nestle Toll House Dark Chocolate Chips. Once the popcorn is covered in marshmallow mixture it is time to add the candy. But don’t wait too long. You want the marshmallow mixture to still be warm and sticky. Sprinkle the candy onto the popcorn, concentrating on the areas with the most drizzled marshmallow mixture. Allow the Denver Broncos Popcorn to cool. Break apart into pieces and serve. Follow the same instructions and steps listed above, just make sure you use this coloured candy!